It looks like I was wrong about Horde Paladins and Alliance Shamans being a joke. Too bad. While this move does solve the mechanical imbalance between the two factions, it does so in the least elegant way possible. (Not to mention that the whining has already started about racial abilities.) I'm kind of disappointed in Blizzard, and I still think that making the two sides less unique is a bad move in the long term. However, a more interesting question is whether this move (and Blood Elves/Draenai in general) will solve the more pressing problem of numerical imbalance. In many ways, the Horde's biggest problem in raiding is lack of numbers. The Alliance has a much bigger pool of recruits to sustain the raiding guilds, and high end Alliance guilds have the option of feeding on lower guilds. But why is there an imbalance in the first place? If you look at this article at PlayOn, you can see that the Alliance:Horde ratio stays fairly steady. However, there is a significant difference between server types. On PvE/RP servers, the ratio is 2 Alliance for every 1 Horde. But on a PvP server, the ration is 1 Alliance for every 1 Horde. Why is there such a difference? I think the explanation lies in the Bartle player types. Killers are far more likely to roll on a PvP server. After all, their entire reason to play is to challenge and defeat other players, and PvP offers far more opportunity for that than PvE. So the difference in Alliance:Horde ratios can be explained with the theory that Killers are more likely to roll Horde than non-Killers. This sort of makes intuitive sense as well. The Horde races project power. They are larger and more brutish. While not precisely evil, they are more likely to be the 'monster' races in other games. So it's kind of natural that a Killer would gravitate towards the Horde. 1. Alliance has better PvE racials that attract the Achiever. While this is true, it's very subtle, and really only raises it's head at level 60. As well, the ratios are very steady, and if this was strictly true, we should see the ratio for Alliance rising as more Achievers switch over. Instead, the steady ratio indicates to me that new players are making characters at the same ratio, before they really understand the mechanics. 2. Alliance races are prettier and do not project power. Perhaps non-Killers prefer playing prettier races. In the case of the Socializer, it may be deliberate to get away from Killers. 3. Non-Killers prefer to play the 'good guys'. Maybe a greater amount of people would prefer to what are normally the good guys, rather than the bad guys. As well, the Alliance has Paladins, which are viewed as extremely good characters. It could also be a combination of things. As well, a lot of people simply follow their friends, so one person who feels strongly about race could influence the choice of a whole bunch of people. My first character was Horde, and I made it because an Achiever friend was playing Horde, and he made his because a Killer friend insisted on playing Horde. One Killer made a choice that dragged multiple Achievers and Explorers along. I am not too sure of the answer. Blood Elves are clearly a 'pretty' race, so that may hold a greater attraction. But their racials appear to be more PvP oriented. And a greater mistake may be that they are evil in the mythos. They have paladins, but the paladins are 'evil' paladins (torturing an angel/Naaru and whatnot). If the motivator to play Alliance is to play the good guys, the Blood Elves don't help in that regard. The problem is that it is fairly obvious why the Horde is more attractive to Killers. But it is less obvious why the Alliance is more attractive to non-Killers, and that will make a huge difference in whether the expansion numerically balances the two factions. Personally, I would have made the Blood Elves an obviously 'good' race, and if they had paladins, to make the paladins truely good paladins. (The Lore, as Blizzard has proven, is fairly easy to manipulate.) At the same time, the Draenai could have been left as their original evil-ish selves. That way, the people who want to play the good side end up on Horde, in addition to the people looking at mechanics and racial looks. To my mind Tauren are an obviously good race ... monsterous, but good. Roll a tauren and do the quests that get you out into the larger world: you'd be comotose to not come away from that feeling like a member of a tribe, at one with nature, a caring, gentle, and perhaps misunderstood race. Maybe the reason PVP is so much more balanced is that, a lot of PVP'ers want to see themselves shine: it is more solo accomplishment, a Romantic champion's dream, to get anywhere in PVP. I'm not saying it is more skill or anything, just that: to get well equipped and accomplished on a PVE server, you need to raid -- it requires 20 to 40 other people over a long time. To get somewhere on a PVP server, you just need to PVP a lot -- it requires only 1 person. Since there is no grouping incentive on PVP servers, any percieved imbalance has a minimal effect on your choice of faction: go Horde on a PVE server, and you won't be doing much end-game content/it is twice as hard to get well-equipped. Go horde on a PVP server, and even if there is an imbalance, it doesnt matter so much. When I heard about the release of the Draeni and the Blood Elves, I thought the 'look' of the race was 'backwards'. However, the feel of the races (racials) are right on. Draeni look like they belong on the horde, but they have a HoT Racial which is more PvE (non-killer) in practice. Blood Elves look like they should be alliance, but their mana tap and AoE Silence has the feel of PvP (killer). When the changes were made so that Paladins were on Horde and Shamans on Alliance, it changed things a bit. If you look strictly at Paladins, for both races, because of the racials you see Draeni Pally as PvE and BE Pally as PvP. The other thing I have to agree with is the fact that a lot of players follow their friends. I started playing this game because my friends did and I changed servers with them, rerolled when they did, etc. I am NOT a killer, but I am a horde on a PvP Server. Sometimes I enjoy PvP (namely when I'm winning, sometimes when I'm not). However, most of the time I wish I were on PvE, so I could just do what I wanted to do without being greifed. My view of a PvP server is that it gives each player a license to greif. That's why killers are drawn so much. I don't know what classification I fit under, I think sometimes I change, but I am definatly stuck with PvP now. I'm actually making an alt for PvP (I think I dislike it on my main because mages are the first to die) and I do enjoy it. I think player classification can change depending on what character they play, or role they play. To finish, I'd just like to say I came across your blog last week and I've enjoyed your articles. For those that know the lore, yes, the Horde are almost more good the alliance races. The horde were slaves used and abused by their masters (orcs and forsaken at least). The alliance humans=treaty breakers, night elves=keep trying to blow up the world, etc. But new players haven't read the lore, they think alliance=good, horde=evil. They aren't going to play a Tauren for the 5 minutes it will take to figure that out. Even though Godsoflust thinks it's "obvious", I meet people all the time that play horde that say "i'm cool, i'm a bad guy. I'm in the horde!" um, no, sorry, horde != bad guys, try reading the quest text! I think GSH's explantions are pretty on. Horde= big bad guys to most people, and so they are attracted to them if they mostly want to fight other players. Alliance =pretty, which attracts socializers. I know alot of people who know the lore and want to RP actually pick Horde. Both because a lot of the books portray the Horde as more honorable, but also there are less leet speaking kids looking for cyber. But maybe that is a different type of social player. RPers want to socialize in character, not as ourselves. So playing the good, downtrodden Horde is attractive to them. I know people that are actually upset that the blood elves are "evil" while the Draeni are good, since this just reinforces people's misconceptions that the horde are evil. (heh plus they broke the lore to do it). I tried to be careful with my wording and limit it to "monsters in other games". The Tauren, for example, correspond to Minotaurs, which are traditionally evil/monsters. Chalk me up for the "followed your friends" list, too. When I started playing a friend of mine was already a dwarf on Lothar (PvE server), so that determined what I rolled (gnome warlock on Lothar). I'm not well read on Warcraft lore, pretty much just what I've seen in WoW. Of the races I've played only the undead seem TRULY evil. The Alliance on the whole seem to be more strongly mired in politics; factions of humans playing agaist each other, dwarven excavation sites not getting the supplies they need, etc. That said, I don't particularly care about the lore. Game balance is more important than backstory. Which isn't to say that Horde paladins and Alliance shamans are the best way to attain that balance, only that I don't think "omg teh lore" is a very good argument against. I'm looking forward to playing a shaman, myself. I agree with yunk's ideas - that if you are a role player your motivations are likely to be different than otherwise. The big success of WoW is the PVE content is nice; but WoW is part of a MMORPG culture that has typically been about epeen success, working within the machine and building a character almost as a system ... that you take out to places and accomplish (even if there are different ideas of accomplishment, from killers, to explorers, etc). WoW has RP separate to support those people who want to experience the content like living out a novel - PVE and PVP alike, is for everybody else. Whatever reason people began to choose Alliance over Horde, it had different effects over time on PVE and PVP servers. To me anyway, the reason is that the big part of "making your unique, beautiful snowflake" in PVE is very raid-oriented, but in PVP it is far more solo friendly. On my (PVP) server, there are probably 4 times as many horde toons in Legionaere/Warlord gear (can't spell worth a damn), than in tier 2 gear. But yeah, that "beginning to choose" likely started from the very beginning of the game, and just has to do with social archetypes of good and evil, of humans being the center of our own stories, and the graphics of WoW mirroring these influences of our actual mythos in real life. oh yeah. The horde will be indignant and so they'll try to kill the alliance guys yada yada yada...point is even the horde hates the blood elves lol :) if they didn't need their magic in combat they'd have killed them along with the alliance! The reason Blizzard is going to allow Paladins and Shamans to swap is for the main reason was to stop the class balancing. Blizzard has stated in several previews that trying to compensate shaman vs. paladin abilities were pulling both classes away from what Blizzard had intended for each class. They want the shaman to be powerful offensive spell casters on the league of the mage while paladins will follow "warrior who can heal" path. Paladins will be gaining a taunt ability as stated by Blizzard so paladin will have a more defined tanking role. I'd better level my undead warrior main to 60 ASAP. When the expansion comes out, there is likely to be a gut of pallys on the horde side... rolling against my warrior for the items I need. I, too, think it was very lazy for Blizz to cop out and just give pally to horde and shaman to alliance, rather than attempt to add new classes or at least additional talent trees to existing classes. So much for arguing over whether horde or alliance is better -- now there will be basically two sides of the same coin. Dynamic asymetry will be gone from WoW. I initially rolled horde because that was what family was playing at the time. I rolled warrior because I liked the class in NWN and though that would be a good intro to the game (though I played sorceress & pally in D2). I tried alliance later, and really didn't care for the human & dwarf land quests, particularly in the level 10-20 range. On the other hand, I found both the undead and tauren starting quests / culture / storyline to be much more compelling, and the combo of Barrens/XR quests, Ratchet quests, and Undead quests for the 10-20 range are IMO far superior to my experiences in Westfall and Loch Modan. Personal experiences vary, of course, that's just my opinion. But on the question of good v. bad RE: horde & alliance, there is no pat answer. There are "bad" factions of the various races in-game that require no knowledge of Warcraft history or back-story. I do have to agree with somethings but non-killers and killers have nothing to do with it. lets put it this way, in pvp or world pvp you still see way more alliance then horde, don't matter. People thing WoW is like EQ, or D&D but its not. err accidently hit enter haha. anyways, The dwarves are (ARE!) attack the Frostwolf clan for Alterac Valley... doesn't that make them the bad guys? OH NO!! cuz they are dwarves???? Warsong clan, they are attacking the Nightelves. Arathi basin, The forsaken and Humans they are both attacking it, fighting for the land. just all im saying is that None of these races are BAD! none at all. The draeni shamans were taught by Orc shamans in the Lore of Warcraft. how ever the Burning legion corrupted the orcs so the Orcs started slaughtering the Draeni. Bloodelves are paladins cuz of Spellbreakers. do you have any idea how hard it is to make a hole new class? to make everything even? it makes sense the Bloodelves where Banished by the alliance cuz they didn't want to help anymore. The forsaken doesn't want to kill the Humans/Dwarves/Gnomes/Nightelves... They want revenge on the Scourge... reason why they didn't side with the alliance cuz of the humans. they where once humans also and seriously... i'd be pissed = P I personally THINK blizzard did a fine job on making everything even... Soo many horde wanted paladins and sooooooooooooo many alliance wanted shamans... well hello you can't give the alliance shamans and horde nothing?!!? I would like to toss in a reason that hasn't really been mentioned yet - gender. For those of us who are female IRL, we just can't relate to any of the Horde races. Well sure, there might be some goth/emo types out there who prefer a 'dark' alter ego, but the typical girls probably won't. 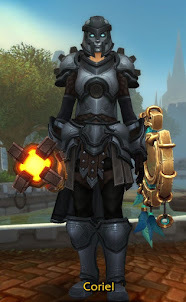 I actually started a Horde character at one point to experience that side of the game, but I just can't seem to bond with her like my Alliance toons. I tried hard to make my Tauren look peaceful and serene, which is about the best you can achieve with a cow. I also made an Undead rogue, but she's just so friggin ugly!